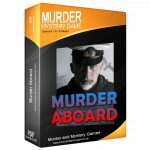 If you’ve not hosted a murder mystery party game before, the experience can appear to be a bit daunting. 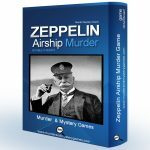 It really isn’t as difficult as it may first appear – murder mystery games are very easy to host. Take your time. The games themselves are quite wordy and require some time to absorb. You don’t need to memorise anything, but it certainly helps to know where everything is. So take your time. Print everything out and read it at your leisure. You don’t need to understand everything immediately – so skip over anything you find confusing and come back to it later. At some point you’ll need to start preparing the game. You’ll need envelopes for each character, into which you will put the character background [profile] and whatever rules are required. That’s usually two or three sheets of paper, plus possibly some paper props. I usually re-read the characters as I stuff the envelopes – it reminds me of who they are and what clues and abilities they start with. You’ll probably find it useful to have a full set of the game notes to hand as well. So having stuffed the envelopes, you’ll need to print out another set in case you need to refer to something during the game itself. I like to have everything complete (envelopes stuffed and packed, invitations sent) at least a week in advance of the party. That reduces the likelihood of last minute rushes. They still happen, but with most of the preparations already complete, I find that last minute rushes are easier to deal with. There are two ways to cast a murder mystery party game. You can either cast in advance, or do it on the day. Both have their strengths and weaknesses. The big advantage of casting in advance is that your guests can prepare for the role. They can find appropriate costumes and props and help contribute to the atmosphere of the game. The main disadvantage is that if someone that you have given a critical character to (say, the murderer) cancels at the last minute, then you need to recast. And that may mean that someone has a quite inappropriate costume for his or her new part. If you decide to cast on the day, you should encourage your guests to dress in an appropriate style. This may mean that you lose a little atmosphere, but does mean you’re not relying on anyone particular. A third option is to combine both. Tell some people in advance which characters they will be playing, and leave some to the last minute to cover all eventualities. Then there’s casting itself – how do you actually decide ‘who’ gets ‘which’ character? There’s no hard and fast rule for this as nobody knows your friends the way you do. I have both cast characters on an entirely random basis and according to who was turning up. Both seem to work. I don’t recommend sending out the whole character background in advance. If you do that, you run the risk that your guests (particularly close friends and partners) may actually start playing before the evening! They may well accidentally give away secrets – and unintentionally spoil the evening. You also have an even bigger problem if someone drops out – you can’t give their character to someone else (because they know things about their first character) so you would need to try and find an extra person from somewhere. First things first – while some murder mystery parties are designed around a sit-down meal, some are not. Instead, the players need the freedom to move around the room, to skulk in corners and to talk privately with one another. They can’t do that if they are sitting down having a three-course meal. If you do want to provide a meal, you really have two options. The first is to provide the meal in advance. Invite your guests early, feed them and then (during coffee) hand out their characters. The problem with this is that dinner parties I’ve been to drag on into the evening. And I’ve rarely wanted to do anything other than digest afterwards. Having a sit-down meal in the middle of a mystery game doesn’t work either – it breaks the atmosphere and forces someone into the kitchen and away from the game. The second option is to provide finger food – it can be prepared in advance (with minimal effort in most cases) and the guests can “graze” at their leisure. You could also ask your guests to contribute to the meal. Drink is another matter altogether. It’s absolutely essential to provide enough soft drink and water. 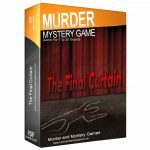 Murder mystery games are conversational, and your guests will pretty soon become very thirsty. So stock up on whatever you think people will want to drink. Whether you serve alcohol or not is a matter of personal preference. Too much will ruin a game, but a little can sometimes overcome players’ inhibitions and start the game rolling. Murder mystery games are much improved if you make just a few efforts to generate the right atmosphere. An appropriate atmosphere helps everyone with their character, and can turn an entertaining evening into a truly memorable one. Here are a few tips on creating a good atmosphere. Costumes: Perhaps the strongest way of creating a great atmosphere is to encourage your guests to wear an appropriate costume. (Costumes look great in photographs as well.) If your guests are finding it hard to find a costume (not everyone has the time or money to search out a good costume), a token effort – perhaps a hat, or coat – can also work wonders. A Sense of Space: ‘Where’ you hold the murder mystery game can affect the atmosphere. While games can be played almost anywhere, try to find a location suitable for the theme of the game, however, most games are held in homes. With a little bit of planning and inititative, consider decorating an area with the theme of the game. Anachronisms: For period games you might want to conceal or remove anachronistic items. Computers, lava lamps and other lightweight can be moved to a spare room. As for furniture and heavy appliances such as televisions and stereo systems, try concealing them with a cloth or blanket. 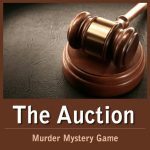 Props: Some murder mystery games involve items such as items up for auction or books for sale. As far as the game is concerned, these are usually represented by slips of card or paper – however, if you have access to suitable props, why not use them? Two caveats. First, if it’s important to the mystery that nobody knows who has a certain item, it might be better keeping it as a slip of card rather than a bulky prop. Second, and I can’t stress this highly enough, never use props for weapons. Period. It’s just too dangerous – anyone passing may not realise that you’re just playing a game and if they see someone brandishing a weapon they might call the police. It’s really not worth the inconvenience. Sound: Period music or sound effects can be used to create an atmosphere. Large libraries often have a music section, with a wide selection of sound effects. Food: If you are preparing food you might want to provide something appropriate to the theme of the murder setting. As written, the murder mystery games cannot answer every eventuality. Your guests are likely to be highly imaginative people. They will have ideas that nobody else has thought of – and there’s only one person they can turn to: you. Unfortunately, that means you’re going to be asked questions during the evening. You can’t predict some of the questions that you’re going be asked – so I don’t even try. My motto: expect the unexpected. I tend to use three simple rules when it comes to answering player questions. Is it fun? Often when a player asks something, they already have an answer in mind. If it sounds fun (which often means dramatic) then I’m likely to say yes. Is it fair? In trying to get an advantage over another character and achieve their goals, players sometimes come up with suggestions that would upset the game for everyone else. In this case I either say no, or add enough requirements so as to make it very difficult to succeed. And then I’ll give the other players plenty of opportunity to make it fail. Make it up. Your guests haven’t seen the full murder mystery document. They don’t know if the game is supposed to go in a particular direction or not. The games generally go in whichever direction the players take them – but that’s okay. As the players don’t know that there isn’t a “correct” way to run a murder mystery game (they are always different), I can therefore invent anything I think is reasonable. And so can you – your guests won’t know the difference. Remember that the host is impartial – you shouldn’t take sides. If someone wants to do something that will put him or her at a significant advantage over another character, you shouldn’t necessarily forbid it – just make it difficult. Make them work for that advantage. P.S. The more time that your guests have to read their characters and the rules, the better. I suggest allowing at least 20 minutes before the start of the game to give people time to absorb the information. That should also give them time to settle down. You’ll have fewer questions if you give everyone a chance to read their characters in peace and quiet. Once you’ve run a murder mystery game once, all of the above will seem like common sense. They do require planning but it’s worth it.